While you’re still being dragged out of holiday mode, social media didn’t take a break. In the social media world, things are always changing and that is especially true for Instagram, Facebook and LinkedIn. Even more noticeable in 2019 is how when one of these social networks makes a change, there is a run-off impact where all the other platforms seem to follow the leader. The social media gurus at Chronicle Republic have compiled a list of updates you should keep an eye out for heading into 2019. Since Instagram’s inception in 2010, it has become so much more than a photo-sharing app, it is now a place of inspiration and a place of action. That is why Instagram has now integrated a way to shop at all levels of its interface. In late 2018 Instagram introduced shoppable posts, in which you could add links directly to your images. But recently they have introduced shoppable story stickers. This allows businesses to use the product sticker to tag specific products in stories, just like you can with regular image posts. Instagram has not only been focusing on e-commerce, another one of their major changes is the introduction of IGTV, a video platform dedicated exclusively to mobile users. Unlike other popular video streaming platforms like YouTube, IGTV is specifically designed for vertical video playback and therefore targeting mobile users specifically. Check out our recent blog on IGTV. Instagram Story Ads have also had a huge impact, as you are now able to insert your ads between the slides of other people’s stories. A number of cosmetic profile changes are coming your way and may be available for some users already, these will include new icons, buttons and tabs designed for both personal and business profiles. Businesses will shortly be able to create Close Friends Lists, which could be an interesting tool for segmenting your audience and showing specific content to certain users. Finally, there is talk of a ‘tinder-esk’ side-scrolling feed view, we’re not sold on this one but well refrain from judgement before we test it ourselves! But let’s not forget about Instagram’s big brother Facebook. Facebook Business is working on offering Facebook Inspire (coming soon to Aus) which can be used by businesses to do exactly what it sounds like – inspire effective ad creation. It provides guidelines and resources to help businesses get started creating ads that speak to their audiences. It also offers tips on branding and framing, and video length recommendations. Following in Instagram’s footsteps, the use of Facebook Stories is growing rapidly. Since Instagram added the ‘auto-share’ option to Instagram Stories, we’ve certainly noticed more activity in this space too. Perhaps now’s the time to channel your inner Baz Luhrmann and begin creating video content that connects to your customers. Another new feature Facebook is said to roll out is Augmented Reality Ads. A new way users can interact and experience different products. For example, if you’re interested in buying a certain lipstick, Augmented Reality Ads can show you exactly how that lipstick would look on you – the potential customer. It’s no secret that LinkedIn has lagged behind Facebook and Instagram when it comes to building new functionality. However, with the release of LinkedIn Pages and updated advertising tools, the new year looks promising. LinkedIn recently announced that it has rebuilt Company Pages “from the ground up” and is rolling out the new LinkedIn Page experience in the U.S., with plans to expand globally in the coming weeks. Other items in the pipeline include customisable call-to-action buttons and PowerPoint presentations and PDFs to enhance brand storytelling. 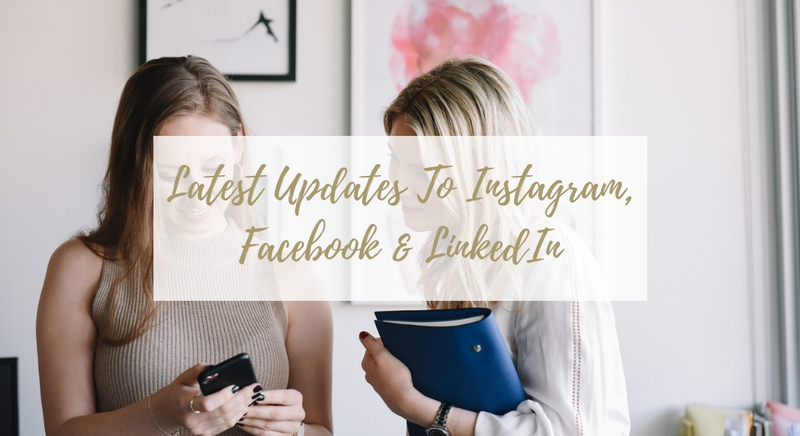 So, there you have it, the latest updates to the ever-evolving worlds of Instagram, Facebook and LinkedIn. We understand with this world at your fingertips sometimes it’s easy to get lost and left behind, but that’s why we’re here!